The blinds are about to increase to 50,000-100,000 with a 10,000 ante. Joseph Liberta raises from the button to 160,000 and is called by Carlo Sciannameo in the small blind. The flop comes [Qh][Td][3h] and Sciannameo checks. Liberta bets 205,000 and Sciannameo calls. The turn is the [8c] and Sciannameo checks once more. This time, Liberta fires 450,000. Again, Sciannameo makes the call. The river comes the [Ks] and Sciannameo announces that he is all-in, having Liberta well covered. Liberta calls and Sciannameo announces "Kings up." Liberta mucks his hand as Sciannameo flips over [Kd][Ts]. Liberta is eliminated in 4th place and takes home $28,087. The flop comes down a monster for both players in the form of [Kh][9d][4d]. Sciannameo flops top pair and the nut flush draw while Davis makes a set. 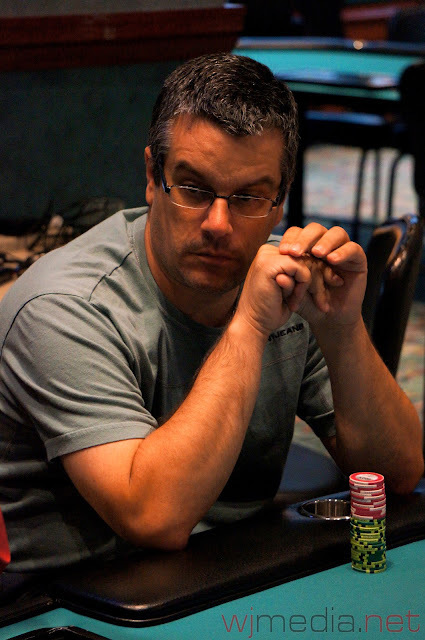 The turn is the [Jc], but the river comes the [7d], giving Sciannameo a flush and the pot. Davis is eliminated in 5th place for $21,156. 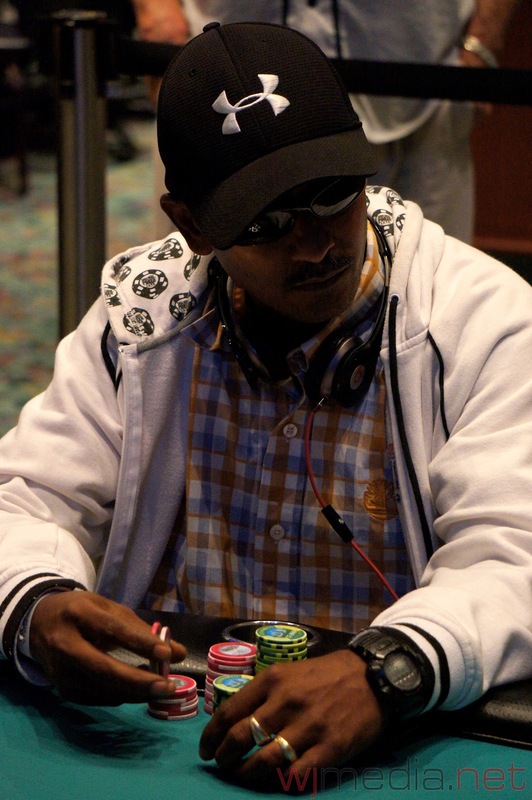 The board comes [Kh][Td][9h][Jh][4d] and Sweillam takes the pot, eliminating Chen in 6th place for $16,160. The board runs out [Tc][3d][2s][9h][7d] and Liberta wins the pot with his ace-king high. Sennon is eliminated in 7th place and takes home $12,548. The board comes [Ac][5h][4d][7d][7c] and Davis takes the pot. 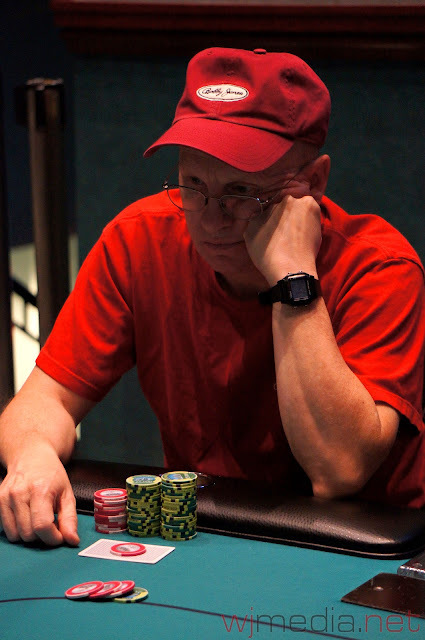 Lahey is eliminated in 8th place for $9,885. The board runs out [Jh][5c][5s][Js][Th] and Bitker's pocket queens hold up to eliminate Schonback in 9th place for $7,890. The board runs out [Kh][Ts][5c][Ks][4c] and Bitker catches a four on the river to win the pot and eliminate Carroll in 10th place for $6,383. The final table of the $1,200 Mega Stack Challenge Main Event has resumed. The blinds are currently 20,000-40,000 with a 5,000 ante. The average chip stack is 1,380,000. You can watch the final table live by clicking on www.FoxwoodsLive.com. We have reached the final table of ten in the $1,200 Mega Stack Challenge Main Event. The players are taking a one-hour dinner break before play resumes. 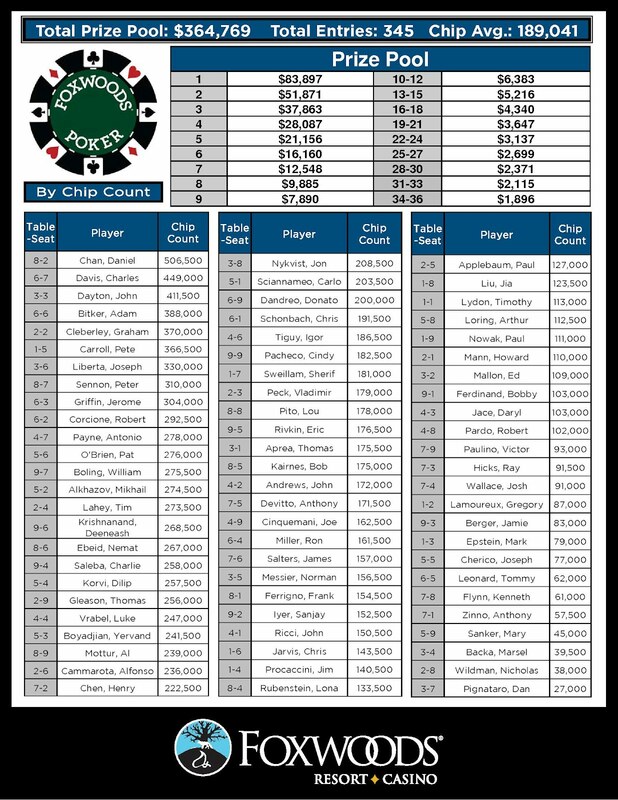 Final table chip counts and seat assignments will be posted momentarily. 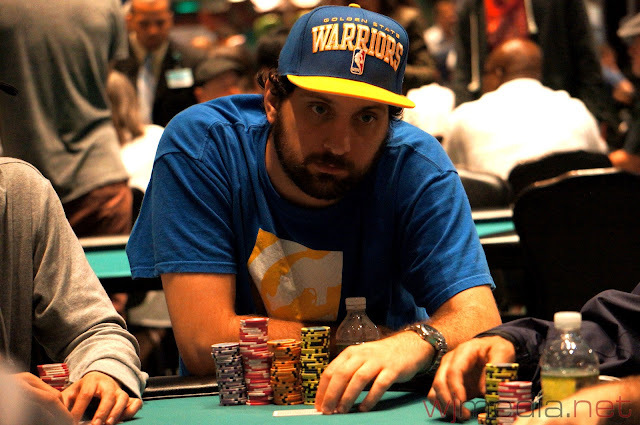 Luke Vrabel has been eliminated when his A-4 could not improve against his opponent's A-8. Vrabel finishes in 17th place for $4,340. 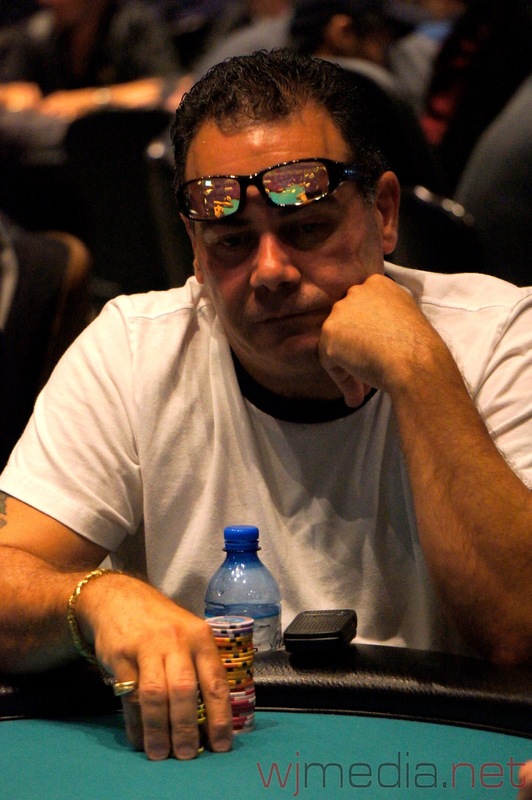 Bobby Corcione moves all-in for his last 268,000 before the flop with A-J but runs into the pocket aces of Tim Lahey. The board does not improve Corcione, who is eliminated in 19th place for $3,647. 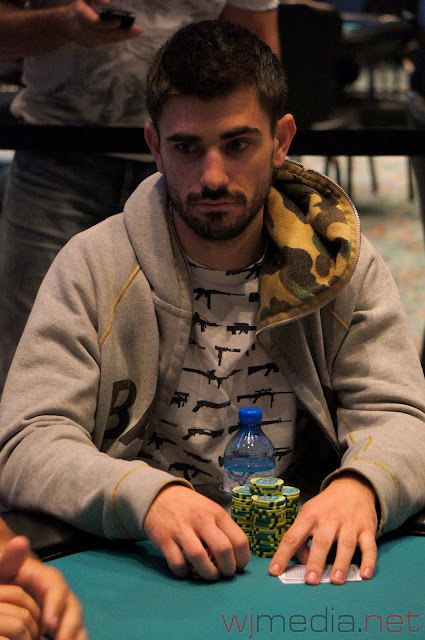 Corcione cashed in three of the four Mega Stack events, including 4th place in the $600 Mega Stack. Daniel Chan has been eliminated from the Mega Stack Challenge Main Event in 31st place for $2,115. The money bubble hand in the $1,200 Mega Stack Challenge Main Event. The money bubble has burst in the $1,200 Mega Stack Challenge Main Event. The video of the bubble hand will be posted shortly. Bobby Ferdinand got his last few chips in the middle with A-3 but ran into his opponent's pocket kings. The board did not improve Ferdinand and he was sent to the rail in 44th place with top 36 cashing. We are down to the final 48 players in the $1,200 Mega Stack Challenge Main Event. The blinds have been increased to 5,000-10,000 with a 1,500 ante and the average chip stack is now 287,500. 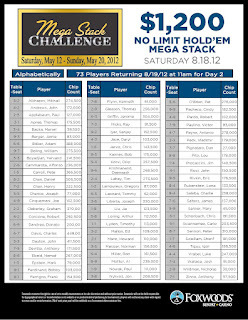 The final 72 players in the $1,200 Mega Stack Challenge Main Event have taken their seats and cards are in the air. The blinds are currently 3,000-6,000 with a 500 ante and levels are 50 minutes in length. You can watch the live stream of the feature table by clicking on www.FoxwoodsLive.com. Daniel Chan is the end of Day 1 chip leader with 506,500. Play has come to an end on Day 1 of the Mega Stack Challenge Main Event. There are 72 players remaining. 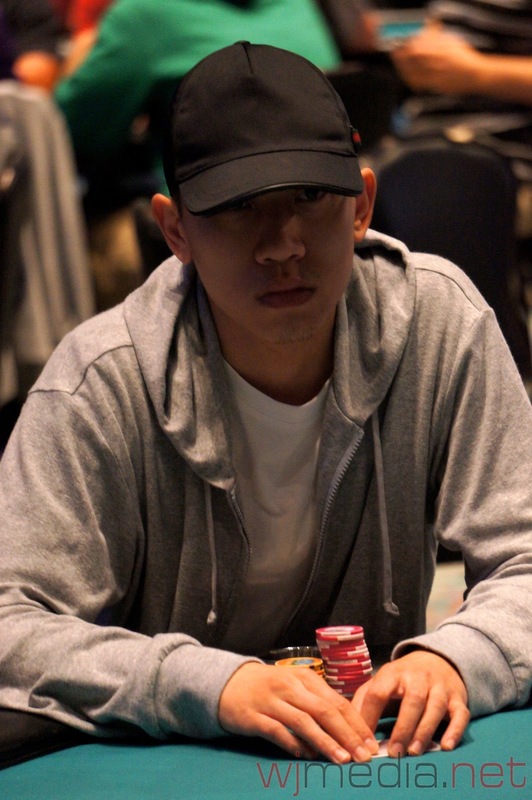 Daniel Chan looks to be the chip leader at the end of Day 1 with 506,500. Play will resume at 11am tomorrow and continue until we have a champion. 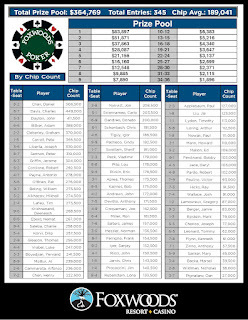 End of Day 1 chip counts and Day 2 seating assignments will be posted shortly here on FoxwoodsPoker.com.